My knitter's origin story - how did you become a knitter? 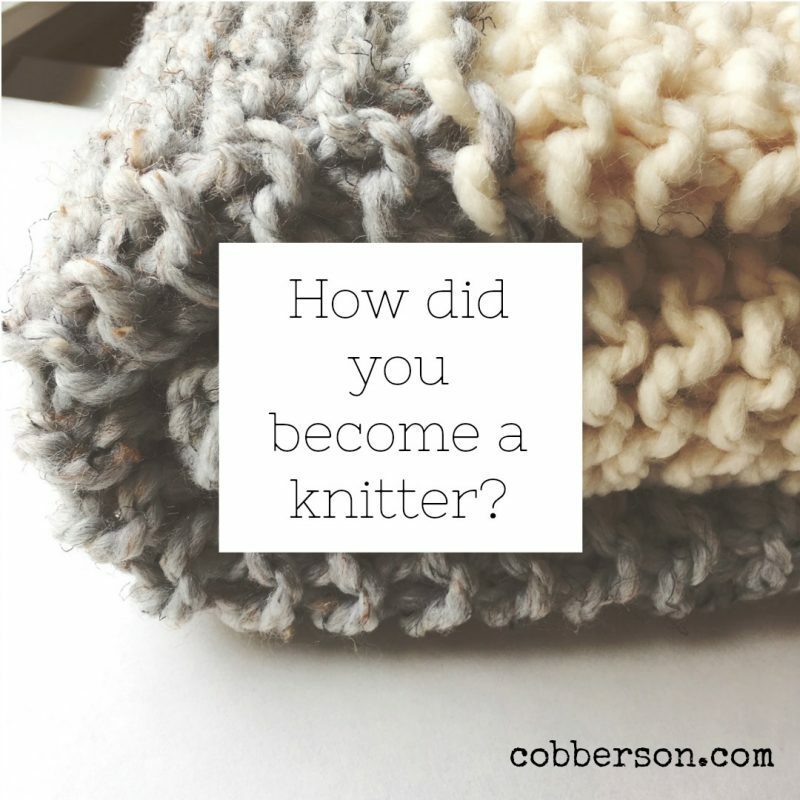 | Cobberson + Co.
My knitter’s origin story – how did you become a knitter? When I was in elementary school, I remember my Nan[a] teaching me how to knit. I have no idea why we even began, since I have no memory of ever seeing her knit on her own. I’m going to assume I came across her knitting stuff in an upstairs closet and then asked her about it, but I have no idea what actually happened. All I know is that somehow, I ended up with her collection of needles and a sweet vintage needle holder that I use to this day. Back then I only knew how to cast on and do the garter stitch. I had zero interest in scarves, so even after knitting several feet worth of what could’ve been a scarf in the same skein of Nan’s cream colored wool aran yarn, I would just take everything off the needle and frog it (rather than bind off and have an actual garment) and start over again. Every so often I’d find this same non-scarf on the needles and just pick it back up, knit a few feet, and rip out. Then it would go back to the drawer it lived in, to sit dormant until i discovered it again in a few months or years. It wasn’t until 2005 that I got seriously into knitting and became a full on crazy yarn lady. The thing that sparked it all was seeing a girl in the mall who was wearing a navy blue knitted hoodie that zipped up the front and had kangaroo pockets. I looked everywhere for something similar, and when I couldn’t find anything even close, I went to the library and took out every knitting book I could find, and taught myself (pre-youtube) in about a week. I started my first blog, Stix and the City, which documented everything I made from my first hat (so thankful my cameras and photography skills have improved since then) to my first sweater, to steeked colorwork. The more I knitted, the more I wanted to learn, and spent so many hours searching online for blogs and free patterns. I eagerly checked Knitty.com every season for new patterns, joined Ravelry as raveler #2851, and joined a bunch of different blog rings,making friends with fellow bloggers that I’m still friends with to this day. I will never forget the day I made my first top down raglan, Stefanie Japel’s Minisweater, because it was literally like magic watching everything take shape when you put the body and sleeves on separate pieces of scrap yarn. Same with the first time I turned the heel on a sock. I knitted my way through college and law school, then for my babies, then my friends’ babies. I knitted through it all. Knitting has been my main squeeze now for almost 13 years. Sure I’ve flirted a little with embroidery and I really like buying scrapbooking supplies and not actually scrapbooking, but I always come back to my first love. How did you end up becoming a knitter? What are your origin stories? Next Post Create daily, live happy.